Steps to Start a Reading Program! It’s so great you’re interested in being part of a reading dog program! We at Reading With Rover commend you! So, where should you start? If you are not in the Seattle area, please check out Intermountain Therapy Animals. 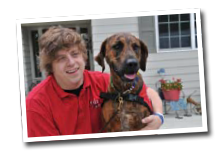 They started the R.E.A.D program (R.E.A.D.® stands for Reading Education Assistance Dogs.) They are an excellent resource for information about using registered therapy dogs in children’s reading programs. We have found the most difficult part of starting up a new reading program is finding qualified therapy teams who want to participate. It takes time and persistence to build teams but it’s well worth it. Many people have good dogs within their own community and simply do not realize it! That’s where your community can help. They can be your eyes and ears and voice, watching and listening and telling people about your program. Contact your local PTA or PTA Counsel. They are often great places to begin the discussion about putting together a program. R.E.A.D, has promotional material that can help you introduce and promote the idea of dogs as reading therapists to administrators and facility staff. Visit and interview local dog trainers and recruit them for your cause. They see numerous dogs and handlers on a routine basis and can help you find qualified dogs with generous handlers who can get involved in your program. Find out if a Pet Therapy Evaluator lives near you and contact them also. A list of existing Pet therapy Evaluators can be found on the Pet Partners® Contact Search page. You can also find all of the information you’ll need about therapy dogs and how they help your community. Again, congratulations on your initiative and interest in pet therapy combined with children’s literacy! What a perfect fit!